Did you know the head of this shark helps it swim better? Cameraman Bill, our only real marine biologist, on location in Oman. Hi Blue World fans! Cameraman Bill here. You may have seen me from such episodes as Giant Pacific Octopus, or The Georgia Aquarium. Jonathan and I get asked a similar question all the time, “How do I get to do what you do?” Well, there is no straight answer to this question. Jonathan and I are both divers who love the ocean and are amazed by the animals in it, but we have very different careers. My day job is working at a large public aquarium as a Senior Aquarist. My day-to-day routine varies, but I’m in charge of display tanks for the public to see, which requires me to be a jack-of-all-trades. The animals I’m in charge of caring for are local animals around New England, and animals found off the Pacific Northwest coast. I’m responsible for their care and well-being. I design their exhibits to be as natural as possible, feed them, clean their tanks and pay close attention to their behavior. Their behavior is very important because that is what tells us how the fish are doing. If a fish is happy, it’s eating regularly, the color of its skin is good, and it’s swimming pattern looks normal. Now all of this isn’t something you just know. It takes years of looking at them and learning what’s normal and good, versus what is unusual and bad. I studied Marine Biology in college, because like most of you, I love the ocean and I’m fascinated by it. I chose a degree called Biological Science. It’s very similar to a Marine Biology degree but it has a broader core, which I thought would give me a better chance at finding a job. During my college years, I missed out on some very important opportunities. I’m going to let you in on something that is not a big secret, but some people overlook it. When you’re in college, one of the best opportunities you have available to you is to participate in internships. I never did this and it put me at a disadvantage. Volunteers and interns are a huge part of the aquarium where I work. They outnumber the staff 3 to 1. I rely on my volunteers and interns heavily. This gives the intern an opportunity to try a job out, see how he or she likes it, and it also puts a foot in the door. If you’re in college and intern somewhere and do really well there, they will make note of who you are, how well you did and will look for you during job interviews. It helps a lot for getting hired. If you are part of our younger viewing crowd, you have plenty of time to choose your path and pick a school you might be interested in. When searching for a college, look at what programs they offer and how well they rank in those fields. There are lots of options to consider when applying for colleges: price, location, degrees, clubs, sports and vibe. You should visit the school, walk around to get a feel for it and ask questions about their programs to see if they are a place you would be interested in attending. Even before college you can find ways to chase after yours dreams. Volunteering stands as a great way to gain experience, knowledge and a feel for a job/field. The internet has so much information and makes it easy to see what people do in a field, and get an idea if it’s something you would be interested in doing. Now if you’re reading this and you’re thinking to yourself, ‘I haven’t been in college in years so how does this apply to me?’ Well the advice still stands, if you’re out of college and are interested in ocean careers, volunteer! Give yourself something different to break up your normal routine or maybe it will give you the inspiration for a career change. There is no direct road to travel to reach your career destination. The path is convoluted and has lots of twists and turns, but never give up and keep trying. A big thing is to also put yourself out there. You have to reach out to people and talk to people so they know who you are. When I was applying for jobs, everyone wanted someone with experience. How was I supposed to have experience if I just graduated? (I’m trying to get this job so I can get the experience!) After graduating college, I held jobs as a lobster restoration project member, a bridge toll collector, an eel grass restoration member and even a cook at a seafood restaurant (how’s that for irony?) --a very convoluted path indeed. It wasn’t until I started volunteering at the aquarium one day a week that things began to fall into place for me. I loved the work I was doing and it showed. The supervisors noticed me and how much I enjoyed it. I was doing well with the work and, eventually, when a job became available, they reached out to me. There are many different careers in the marine field too: research, education, law enforcement and animal care (veterinarian and vet techs). There are lots of options for people out there. Jonathan and I are very lucky to be able to do what we do and we know that. There are lots of people out there competing for our jobs. Competition is tough but it’s also a great motivator to push you to work harder and strive for new ideas or innovations. Jonathan has struggled and worked hard to get where he is and continues to work hard for his passion. It may look all easy, just swimming around filming animals and posting it on YouTube, but believe me it’s more work than you realize, and much more expensive than the average YouTube production. I love diving and I love the marine animals, which translated to wanting to film and photograph them. When I first saw Jonathan give a talk about his work, I was blown away and thought, “This guy has the best job! He just flies around and films animals, how cool is that? !” But after talking with him over the years and then joining the Blue World team, I’ve grown a new appreciation for what he does and how much he puts into it. It’s a full-time career making sure that everything looks good, the best footage is edited AND staying up-to-date with technology as it changes. When Jonathan and I first started shooting underwater we were using film, actual film!!! Now things are shot in 4K and ultra high-def. Digital pictures makes it so you can shoot 1,000 pictures and hopefully some are good. But you know what? We still love it. I love my job, working with the fish and invertebrates, and I love getting out into the water to dive and see the life out there. That will never get old for me and the same goes for Jonathan. 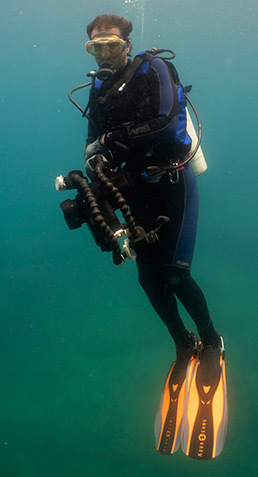 If you want to do what Jonathan does, get out there and get dive certified and start taking pictures. Take some classes on photography, talk to experts at shows or at dive shops. Get out there and do what you can and see how you like it. We may not all end up with our photos in National Geographic but we will definitely have fun trying and experiencing so many new things. Good luck to you all and best fishes!